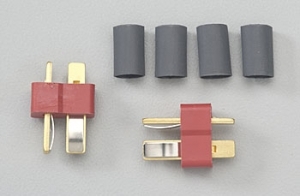 (2) Deans Female Connectors with Shrink Wrap. Deans plugs are small, easy to use and work at loads up to 60 amps. All connectors also come with shrink wrap. Male connectors are normally used on the chargers and esc's.